​This project was carried out in a spirit of harmony, exhilaration and revelation. None of the images were in any way planned but emerged spontaneously from the particular energies associated with their location. ​They were created with materials found on the site and were left when finished to break down and change into other unpredictable patterns. These images are only a dim reflection of the life that runs through the bones of the hills, dances in the dust, ebbs and flows in rock and water and beats like a great heart inside the mountains. ​Below are two double-page spreads: the first featuring Tony Convey's creations; the second, nature works by Sylvia Convey. 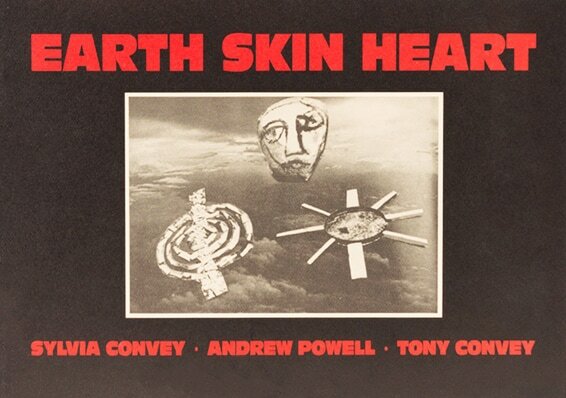 There are only six copies of EARTH SKIN HEART for sale. If you would like to purchase your copy for $AUS40 + postage, please visit our store here. If you would like more than one copy, please email us here.